So Many Kids With So Many Needs. Let’s All Jump in and Help! Seeing so many pictures of Asa and his team in Ecuador makes me think more and more of Gladis, the little girl we sponsor in Honduras. We’d love to go visit her someday. Hold her, hug her, play with her, meet her family, and encourage her friends and those who are taking care of her through One Child Matters. In the meantime, I appreciate so much that Asa is able to love on kids in Ecuador right now. Truly, there are kids everywhere who need love, who need Jesus, who need care, food, medical attention, and education. 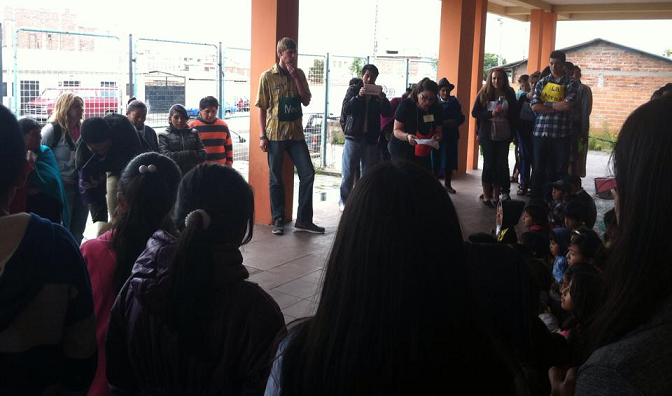 Here is a picture of Asa on Sunday, surrounded by a crowd of Ecuadorian children. from the story we read about in Matthew 7. My heart longs to help more and more of these kids. I know our family can’t sponsor them all, but right here at Heavenly Homemakers – there are a lot of us. You, and you, and you, and you, and you. 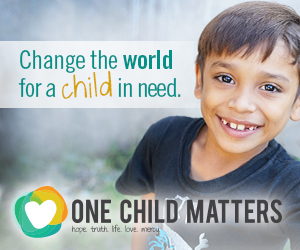 If each of us sponsors just one child in another country, do you know how many children can be reached? Thousands! Please take a look at all the countries and children who are looking for a sponsor. I believe this is a ministry that is very doable for many of us. It is a small financial sacrifice on our part to make a huge spiritual difference in the life of a child. Thank you for writing this post! I recently wrote about my favorite Mother Teresa quotes (http://wp.me/p4viGJ-7I). Two of the things she said that are among my favorites are: “If you can’t feed a hundred people, then feed just one” and “Live simply so that others may simply live”. I think it is important for us to realize that just because we cannot solve the issue of world hunger, it doesn’t mean that we shouldn’t try. That often starts with just one child. I also believe that we should look at how blessed we are and choose to intentionally live with a little less so that others can “simply live”. Do you know what village Gladis lives in? I just got back from Honduras yesterday… not that I went to hers, but it would be pretty amazing if I had. My church partners with Mision Caribe (www.caribbeanoutreach.net) in Tegucigalpa, and they’ve planted 9 churches in the city and in some villages as far as 4 hours away. Praying for your Gladis and her family!